Cranetech’s range of Maxilift vehicle mounted cranes is ideal to install on light commercial vehicles, such as utes and other various transport vehicles. Our ute and vehicle mounted cranes will provide you with a flexible and portable crane that is relatively easy to handle and highly effective for those smaller lifting jobs. Compact, light, simple to use and technologically superior, Maxilift cranes have many features that make them an indispensable necessity in multiple industries, such as transportation, building, marine, and mechanical repairs to list but a few. Contact our specialist consultants at Cranetech to discuss our range of ute and vehicle mounted cranes for sale. Load limiting device with visual and audible warning (except “D” version cranes). Multi-function proportional control bank with a high degree of control. Compact, ergonomic and versatile control console. Functionally engineered, simple and very reliable. High tensile hexagonal one piece boom structure. Innovative low maintenance rotation system. 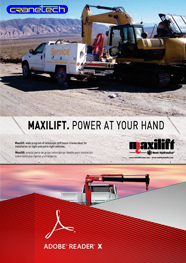 Maxilift is one of the most renowned brands of cranes in Australia. When it comes to hydraulic ute cranes or any other vehicle mounted loading cranes, we are proud to be associated with Maxilift, which is without a doubt one of Australia’s favourite small cranes. They are particularly useful in the construction industry and have different capabilities, which are able to handle anything from 0.5 TM to 5 TM. These cranes are portable, flexible and easy to mount on your ute or other vehicles. They also come with a range of accessories to help execute the more complicated lifting jobs. Our hoist cranes are used for variety of specialist applications in the industrial sector and can be used at a workstation or as an overhead travelling crane, which is ideal for stacking heavy loads in a warehouse. Click here to view our knuckle vs boom cranes blog post.